Flinders Ranges Accommodation Booking Service - Starting Point for Touring the Flinders Ranges. 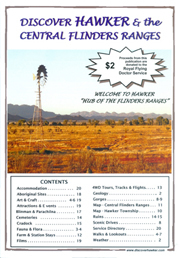 Flinders Ranges Self Contained Accommodation in and near Hawker. Come and enjoy our Flinders Ranges, stay in one of our accommodation properties, visit the gorges, take in the scenic drives. Explore the beauty of Flinders Ranges of South Australia. 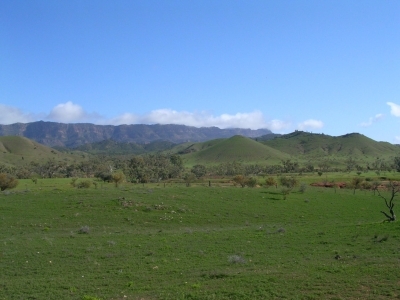 Take a look inside our website and book a holiday in the Flinders Ranges. FRABS and the Visitor Information Centre are situated in HAWKER MOTORS, MOGAS Service Station. HAWKER MOTORS the store with MORE. Frozen Meat, Groceries, Eggs, Bacon, Milk, Hardware, Souvenirs, Books, Camping Suppliers, Hats, Sun Glasses, Tyres, Batteries, Fuel. The table below has links for you to choose a property to stay in Flinders Ranges Accommodation. You can check the Location of the property by clicking the Location Map link in the table below. Please note: All prices shown on the property pages are subject to alteration each year. Come and enjoy a holiday with Flinders Ranges Accommodation, we have a great outdoor life style for your enjoyment. There are many places in the Flinders Ranges for you to visit, so come and stay in accommodation in the Flinders Ranges. Some of the drives in the Flinders Ranges are Brachina and Bunyeroo Gorges for scenery and geology. A great place to visit is Moralana Scenic Drive, a gentle drive between Wilpena Pound and the Elder Range. Take a drive and see Kanyaka Station ruins approximately 25 kms south of Hawker. Lookouts near Hawker are Jarvis Hill Lookout and Castle Rock. Arkaroo Rock is an Aboriginal rock art site near Wilpena. Visit Blinman and take a heritage mine tour. While you are in Blinman try a Blinman pie from the Blinman shop. Don't forget to pack your camera you won't want to miss many good photographs of the Flinders Ranges. When in Hawker in the central Flinders Ranges check out Jeff Morgan's Gallery and Panoramas across the street from Teague's Hawker Motors . If you need tyre service while in the Flinders Ranges call 86484014 Hawker Motors. THE FLINDERS RANGES A GREAT PLACE TO HOLIDAY COME AND ENJOY. 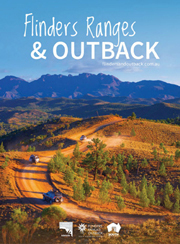 2018 Flinders Ranges & Outback Visitor Guide available here . In HAWKER Purchase a Discover Hawker & the Central Flinders Ranges from the Hawker Visitor Information Centre which is located in Hawker Motors.